I just wanted to say hello and say thank you again to everyone who has been so supportive, and for faithfully following me on my journey. This week is turning out to be very busy. There are not enough hours in the day this week. I am busy getting ready to leave the ship :( There are things to do in order to "disembark" the ship, there are friends to hang out with, patients to see. I have only 2 more shifts to work. We went back to working 8 hour shifts so I work 2-10pm tonight and then 7-3pm on Friday. Thursday I am going to a construction site - to work. I am excited to get to go to a construction site and actually do some work. My friend Jodi and I are going so we will see how it goes. Luckily the construction project is near the beach so if we get in over our heads with the construction we have been promised by our friends that manage the construction site that we can go to the beach instead! I just want to do so many things and only a few days to do them. I am going to be stopping in Belgium for a few days (thank you Jodi for hosting me!!!!) and I think it will be a welcomed rest for me. Seems I am almost as busy this week as I was the week before I left to come here. All this week too I have been trying to think about what has happened in the past 2 months. 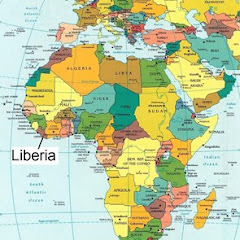 What has happened in Liberia, what has happened in me. Way to much to try to blog about - which is why I look forward to coming home and talking face to face with all of you! The bottom line is that God is good. He called me to Mercy Ships and has been faithful to me every step of the way. He has given me the strength to be here. It has been a gift to be here and I am grateful God allowed me to come. There is no greater joy or contentment than knowing you are doing what you were created for - and that has been the greatest gift for me over the past 2 months. There is a song that says that "the glory of God is man fully alive". I can say that is absolutely true. I have never felt more alive and I know that brings glory to God. That is why I am immensely grateful to everyone in my life for encouraging me (all these years) and for helping me, for coming along side me to get me here- because it has changed me. I have learned that obedience to God brings life, hope, peace, joy, love, confidence, faith, contentment, and a thirst for more!!! Your note touched me so much it made me cry. God so lives in you...what a blessing it is to know you. Be safe and enjoy the last few days. Bless you and love you ~ Virg. What an amazing summarization of your trip and the journey you have been on! Its been such a blessing to read your blog, the African people are beautiful people created in God's image- isnt it just amazing how vast His creation is! Have a safe trip home!